What on earth is Earthdog? 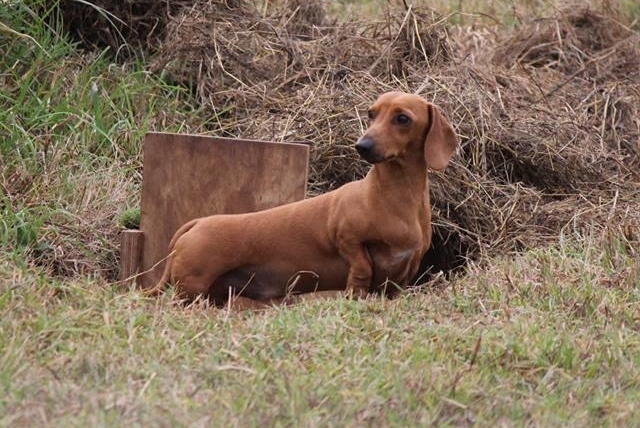 Many Terriers and Dachshunds were bred originally to hunt, chase, go to ground and bolt quarry of one kind or another, usually fox, otter and badger. 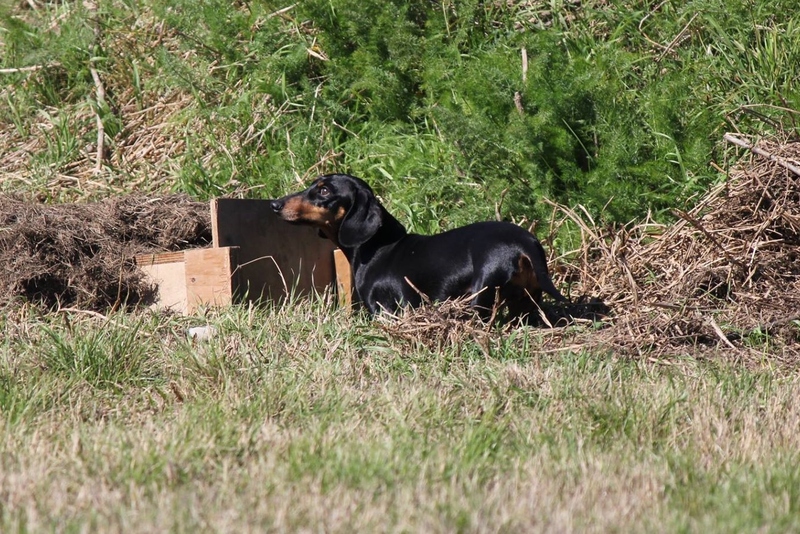 Today, the sport of Earthdog allows these dogs to use their natural instincts in a safe, simulated hunting environment. They can have lots of fun, and earn titles too. Earthdogs are tested on their ability to enter the den, find their way to the ‘quarry’ through a series of turns and tunnels, and work the quarry. These challenges become increasingly difficult at each stage. Dens are constructed as a series of trenches dug in the earth, into which 3-sided liners are fitted. The liners are in sections and have wooden roof and sides, the floor is exposed dirt. This means that tunnels are totally safe and cannot collapse and also that they can be configured in any manner. In the Earthdog Instinct Certificate test the total length of the den is only 3 metres, with one turn; but by Masters level there are over 9 metres of tunnel, with multiple turns, exits, false dens, a constriction and an obstruction! “Dogs six months of age or older and registered with the ANKC are eligible to participate in earthdog tests, as are spayed and neutered dogs with Limited Registration provided they are classified as eligible breeds. The following breeds are classified as eligible to participate in ANKC earthdog tests: Dachshunds, Australian Terriers, Australian Silky Terriers, Bedlington Terriers, Border Terriers, Cairn Terriers, Dandie Dinmont Terriers, Fox Terriers (Smooth and Wirehaired), German Hunt Terriers, Glen of Imaal Terriers, Jack Russell Terriers, Lakeland Terriers, Manchester Terriers, Miniature Pinschers, Norfolk Terriers, Norwich Terriers, Parson Russell Terriers, Portuguese Podengo Pequeno, Scottish Terriers, Sealyham Terriers, Skye Terriers, Tenterfield Terrier, Welsh Terriers and West Highland White Terriers. All Earthdog tests are held at the Bill Spilstead Complex for Canine Affairs, 44 Luddenham Road, Orchard Hills. The terrier den area is at the rear of the complex, behind the sheep herding area.